sharing is mutually detrimental, but various mechanisms of resource partitioning may sufficiently reduce overlap to permit coexistence. The strength of species interactions is most evident when the abiotic environment is moderate, and may be reduced or undetected whenever environmental variation is extreme. The study of herbivory in stream ecosystems has focused mainly on the grazing of benthic algae by invertebrates, some fishes, and a few amphibian larvae. Benthic algae vary in their distribution, growth form, and nutritional value, and grazers differ in their means of scraping and browsing this food supply. Grazers have numerous impacts on algae, reducing their abundance, altering assemblage composition, and even stimulating algal growth and overall productivity through the removal of senescent cells and the recycling of nutrients. 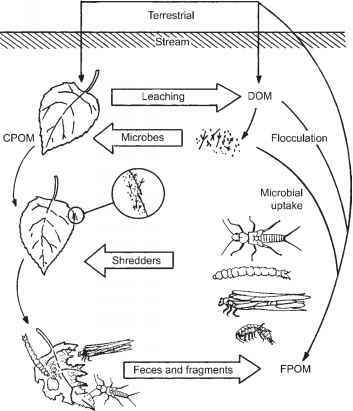 Strong effects of herbivory in streams have been documented with a number of invertebrates, including snails and some caddisfly and mayfly larvae, and in fishes such as the stoneroller in North America and armored catfishes in the Neotrop-ics. Under the usually moderate environments in which most grazing studies are carried out, top-down control of algae by grazing appears to be at least as strong as bottom-up control by nutrient supply. 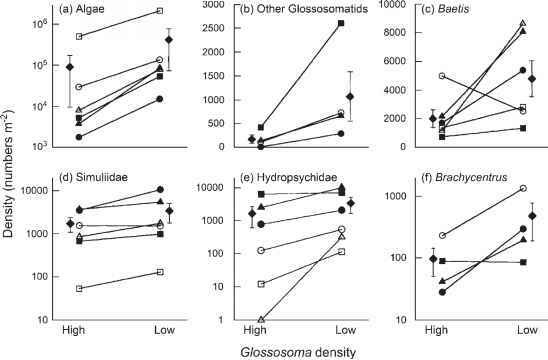 Disturbance, particularly due to extremes of flow, can alter the grazer-algal dynamic by reducing grazer abundance, and heavy grazing pressure can reduce algal biomass to a level where it is less vulnerable to scouring during high flows. Predation affects all organisms at some stage of the life cycle, and many species encounter predation risk throughout their lives. It affects individuals and populations directly through consumption and mortality and also can result in behavioral and morphological adaptations that may entail some fitness cost to the prey. The many fascinating examples of the foraging behavior of predators and risk-avoidance tactics of prey attest to the importance of this interaction to both parties. Prey species depart from risky environments, restrict the time of day and location of foraging, and evolve morphologies that may exact a cost in growth or subsequent reproduction. Because the prey are themselves consumers of other resources, these responses help us to understand how the indirect effects of top predators can extend throughout the food web. Top predators have often but not invariably been demonstrated to limit the abundance of prey populations, to confine the prey's distribution to habitats where the predator is absent or ineffective, and in some instances to trigger an elaborate cascade of interactions with consequences for whole ecosystems. Habitat conditions, the identity of the top predator, the magnitude of external subsidies, and environmental disturbance can act as switches that turn a cascade into a trickle, or the reverse. Competition between consumers for a shared resource either through its mutual exploitation or by aggressive interference depends on the extent of niche overlap versus niche segregation. Estimates of overlap in diet, habitat, or temporal activity of groups of species that share a common resource are often used to infer competition. Field observations such as the different mesh sizes and locations of the nets of hydro-psychid caddis larvae or use of stream habitat and time of day for foraging by stream fishes suggest how interactions within groups of potentially competing species can be ameliorated through the partitioning of diet, space, or time. The large literature on resource partitioning among stream-dwelling invertebrates and fishes provides much insight into the specialization of individual species, but because the extent to which resources actually are limiting often is unknown, this is weak evidence for the importance of competition. Experimental studies with invertebrates have documented numerous cases of aggressive interference, mainly involving space limitation, and in some cases the interaction is as much predation as competition. Evidence to date may reflect challenges of experimental design and scale, as is suggested by the system-wide effects that followed the decline of an abundant grazing caddis affected by a parasite outbreak. It seems that competition can be an important interaction in stream assemblages, but the extent of its influence is not well understood.